I don't frequent the Northwest area all that often. It just isn't all that convenient these days. If I was a regular over there, Pints Urban Taproom is a place I would visit often. 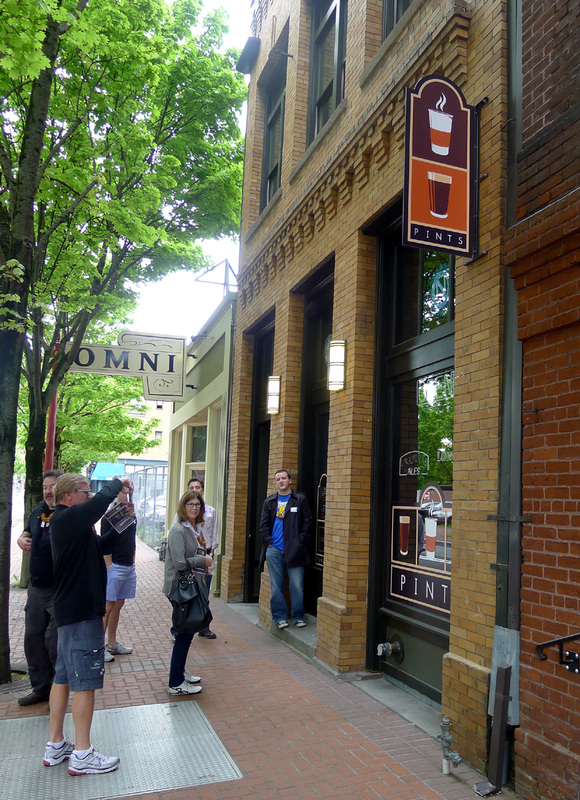 Pints is nominally a coffee house by day and a pub by night. They open for coffee and pastries at 7 a.m. weekdays and shutter the morning operation at noon. They reopen as a pub from 4 to 11 p.m. On Saturdays they're just a pub from 6 to 11 p.m. Live music is also part of the mix (best check their site for details). The space is pleasantly inviting, with ornate brick, a classic wood bar and artwork on the walls. They are in the process of expanding their kitchen facilities. They already offer sandwiches and snacks; my guess is they will expand their menu somewhat once the kitchen is fully functional. You're wondering about the beer, huh? This is a beer blog, after all. 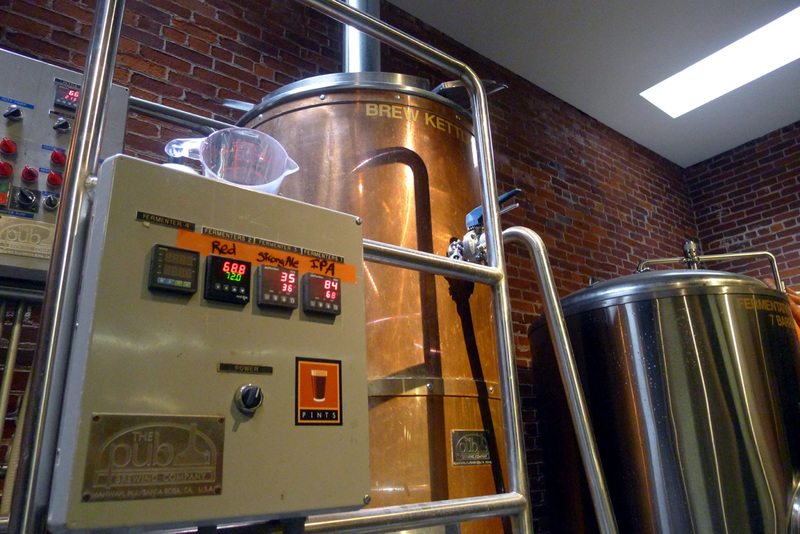 Well, brewer Zach Beckwith heads up the brewing operation at Pints. 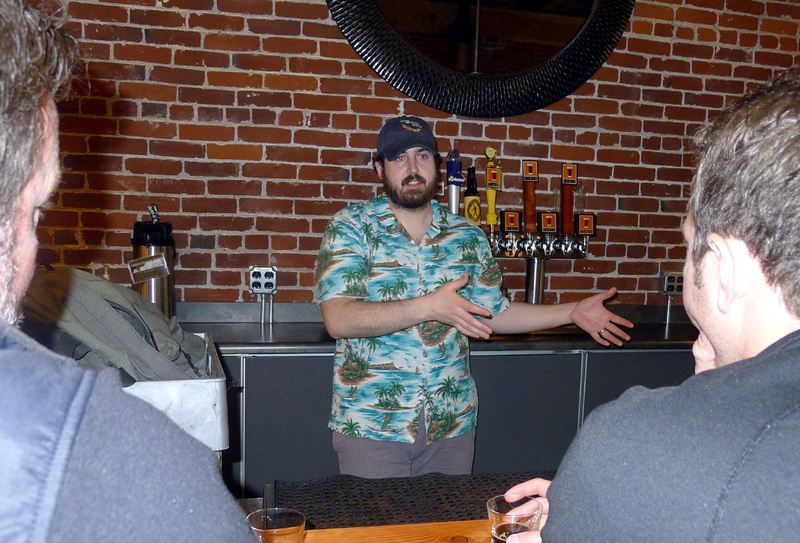 He came over from New Old Lompoc a few months ago, then worked with the owner to design the brewery and pub space. Pints has 10 taps, six of which were occupied by Pints beers on my visit. Choices include: Tavern Ale (5.1% ABV), Seismic IPA (6.1% ABV, 77 IBU), Rip Saw NW Red (5.9% ABV), Steel Bridge Stout (6% ABV), Legalize Wit (4.9% ABV...a collaboration with Lompoc for the recent Cheers to Belgian Beers festival) and Red Brick Rye (5.2%, 40 IBU). My visit to Pints was part of a Brewvana Tour, so I did not taste all the beers. I did taste the Tavern Ale, the IPA and the Stout. They were all pretty good. You'll have to make your own choice based on personal preference. Hard driving IPA fans will want the IPA, and so on. 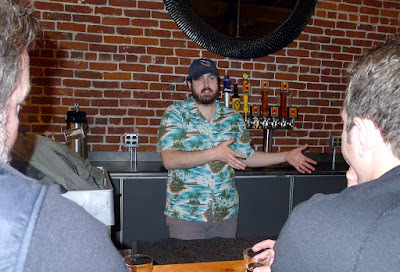 Zach's approach to beer and brewing is decidedly out of the mainstream in today's Portland. He talks about getting back to the basics and producing beers reminiscent of the beers that got the lot of us hooked on craft beers in the first place. Even his seasonal offerings will apparently be modest. If you've been watching trends, you know it's quite popular for breweries around town to offer one or more one-off, special beers at any given time. Barrel-aged IPA with lemon zest and a ginger twist is a style that comes to mind. Most imaginative. But I digress. I cannot say what will happen to the brewing community as it moves further and further away from what would be considered traditional styles. I'm not even sure if the trend is a bad thing. What I will say is I'm impressed that Zach is taking the approach he is at Pints. I wish him well.